Gavin Iacono, Deputy Ag Commissioner Tulare county, overseeing Standards and Quarantines, notes that the state is waiting for the USDA sign-off on a new plan that proposes five-mile quarantines around the two blunder trap sites where six Asian Citrus Psyllids were found June 25-26. The quarantines would overlap each other since the traps were about two miles apart. Iacono said this is a proposed change from earlier quarantine protocols. “Originally all quarantines were county-wide, and the USDA, with justification, shrunk it down to a 20-mile radius. Now the state is proposing a five-mile radius, which is a big change of what it has been in the past,” he said. No fruit can move out of the quarantine areas unless it has been treated and/or free of stems and leaves. In the proposal, the state is going to require preharvest spray treatments not only for the proposed quarantines in Porterville but for all active ACP quarantine areas in the state. There will also be an 800-meter eradication zone in place around each site. “What this means is that all citrus within 800 meters around the trap sites must be treated with control sprays,” Iacono said. “Quarantines are automatically for two years. Within the two years, if nothing is found, the quarantine will be lifted. But no ACP quarantine in California has ever been lifted. We have been close, but then we find something just before the quarantine can be lifted,” Iacono said. “On June 17, 2013, the state lifted a restricted zone in the Strathmore area following ACP trappings in mid-November 2012. And now, not a month later, we trapped more ACP in the nearby Porterville area,” Iacono said. Based on science, the new finds are suspected to be more serious due to the possibility of a breeding population in the area. “But we are not able to find it. This is why there are mandatory spray programs in place,” said Iacono. Officials are not sure why inspectors are finding the ACP in commercial orchard areas in the Valley. 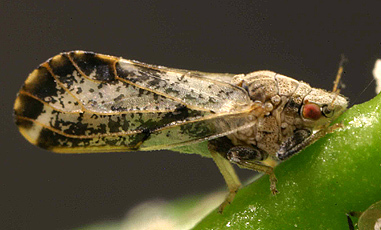 “In southern California, they first found the Psyllid in the urban area, and then it spread out from there into the commercial areas. In the Valley we keep finding it in the commercial areas,” Iacono said. “Intense inspections of traps in the City of Porterville, so far, have found no Psyllids. In fact, inspectors surveyed more than 300 residential properties yesterday and did not find anything,” noted Iacono. Inspectors are fanning through orchards with white beat sheets that have been sprayed with soapy water. They beat branches three times and observe anything that falls on the white sheet. Because the inspectors are trained, they can quickly determine if a Psyllid has fallen on the sheet. The water holds what falls in place on the sheet. After each inspection, the water is wiped off and reapplied for the next inspection. Many of these crews are coming up from Southern California where they have been doing this extensively for the past five years. It’s important that everyone inspect his or her trees for the ACP. If you find it, act fast. Time is critical. The ACP Hotline number is (800) 491-1899.